My baby was bald for so long that I would use hair clips on the little wisps of hair so that everyone would realize that she was a girl. Now that she is four years old and her hair has grown to shoulder length we love picking out hair clips together more than ever! Hippie Clippies has an adorable selection of stylish hair clips for girls in a wide variety of fun patterns and colors. These hair clips are handmade and the attention to detail is evident by the heat sealed ends to prevent fraying (I have experienced significant fraying with other brands in the past). Each hair clip has a color-coordinated no-slip grip so that it holds surprisingly well in my daughter’s very fine hair. In fact, my daughter wore these in her hair to the zoo and the park and it didn’t slip out of her hair once. She really likes the Swirly Butterflies Pack of 4 hair clips that is so pretty for springtime. 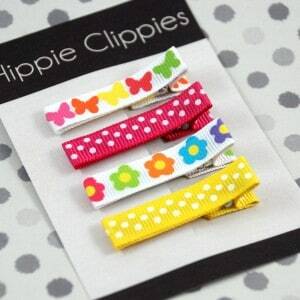 A pack of 4 Hippie Clippies hair clips is only $12.99 and would make a really nice gift idea or Easter basket addition. Hippie Clippies has a lovely collection of hair accessories not only for children but for women too. There is even a really neat collection of nursing necklaces that I would have loved to have had. What a great way to distract baby (and avoid those dreaded pinches and hair tugs too! )……plus it is super stylish! You are invited to visit Hippie Clippies website and pick your favorite hair clips or accessories. You can also connect with Hippie Clippies on Facebook and Twitter.